Though more than a decade has passed since I last lived in Syria, I continue to spend some part of every day walking its neighborhoods, if only in my memory. I often think back to when I used to sit every evening at the Umayyad mosque in Damascus as the sun began to set, waiting for the mosque courtyard to slowly transform into a pool of light. Children would gather to sprinkle birdseed on the ground or chase after pigeons in flight. The entire world around me became illuminated. A girl sifts through birdseed at the Umayyad mosque in Damascus. Photo by Stephanie Saldaña. The sight of all of those people caught up in laughter and light, their profiles visible against the backdrop of brilliant mosaics and intricate tile work, was unlike anything I had ever experienced. For a few minutes every evening, the world— and everyone in it—was aglow. 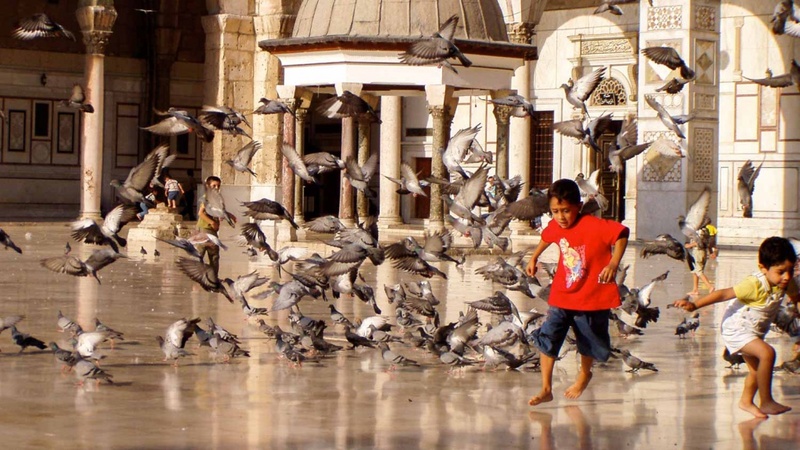 A boy sprinkles birdseed at the Umayyad mosque in Damascus. Photo by Stephanie Saldaña. As I sat in the corner, quietly taking photographs, strangers would come up to me and introduce themselves, curious to know what I saw in all of those ordinary people caught up in the light. And as we got to talking they would begin to tell me stories about the mosque, about themselves, about their country. “Are you a Christian?” They would inevitably begin. When I answered yes, they would eagerly tell me that the head of John the Baptist, who was called the Prophet Yayha in the Quran, was buried in the mosque, and that it had once been the Church of John the Baptist. Some mentioned that, in the early years of Islam in Damascus, Muslims and Christians had prayed there together. A young boy once pointed to a minaret. “Do you see that?” he asked me. “That’s the Jesus minaret, where the Prophet Jesus will come at the end of time.” And I looked up to see that minaret also glistening in the light, surrounded by birds in flight. There is much to say about Syria, particularly about the famous kindness the locals showed to strangers who found their way there. I will say only that it was a place where I learned about our common humanity, that the way in which we live together in our differences should be a point of pride, of hospitality, a story to be treasured. It was where I was told, again and again, that we are who we are because of those who came before us—and that we learn who we are because of those who are different from us, but who meet us in order to be our teachers. Two generations, hand in hand at the Umayyad mosque. Photo by Stephanie Saldaña. It was at the Ummayyad mosque that a man who had come to pray—upon hearing that I was a Christian— told me the story of the monk Bahira, who according to tradition met the Prophet Mohammed in the city of Bosra in southern Syria when he was still young, and who foreordained that he would one day become a prophet. He explained to me not only that Muslims and Christians are brothers, but that they had been tied since the earliest days of the Islamic faith. Later, I traveled to Bosra—a city of Roman ruins constructed of famed black stone– and tracked the story down. There, I found Muslim pilgrims seeking out the ruins of a Christian basilica—the place where Mohammed had met a monk who helped the prophet understand who he was and what God intended for him. The Roman Theater at Bosra, made of the city’s famous black stone. Photo by Linda Delikiz. Syria was a country of surprises. It was a space long traversed by trade routes, at times holy to Muslims, Christians, and Jews, and the remnants of their stories were marked into the landscape, among older ruins of civilizations dating to the Early Bronze Age. The stunning frescoes of the Jewish synagogue of Dura Europos, dating from the second century and decorated with a rare series of human representations, were displayed at the nearby museum. The city of Aleppo had safeguarded the Aleppo Codex for centuries before it was moved—one of the most important copies of the Hebrew Bible in existence. St. Paul had reportedly been thrown from his horse by a blinding light on Straight Street in Damascus—an event that would forever change the history of Christianity. The tomb of the great Islamic Sufi poet Ibn Arabi was still revered in the neighborhood of Salihiye in Damascus, and the great Shiite shrine of Sayyidah Zeinieb lay in the city’s southern suburbs. And the Umayyed mosque held its place at the heart of Damascus, glistening with mosaics, and visited every day by Sunnis and Shiites and Christians and others who simply wanted to drink in that light, all of who seemed to find a corner in that immense courtyard to be in silence. In the markets outside, visitors from abroad mingled with travelers from all over the Arab world. 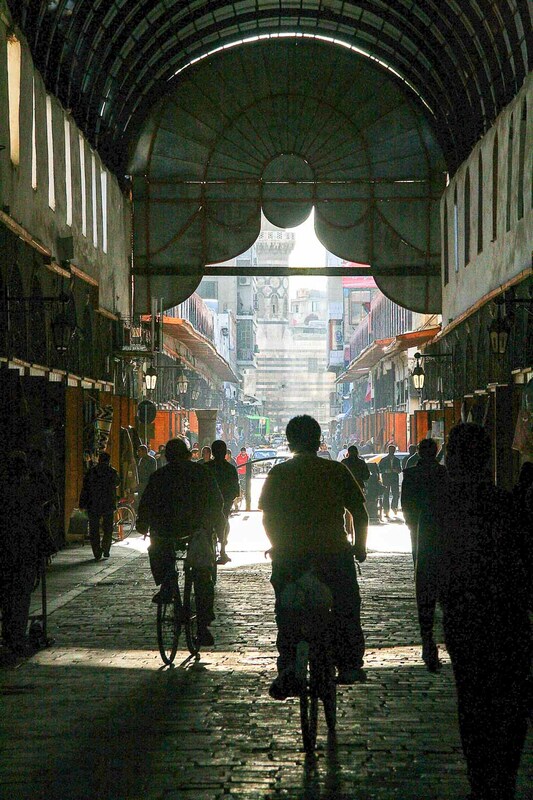 A boy rides his bike through the Souq al Hamadiyah in Damascus. Photo by Linda Delikiz. 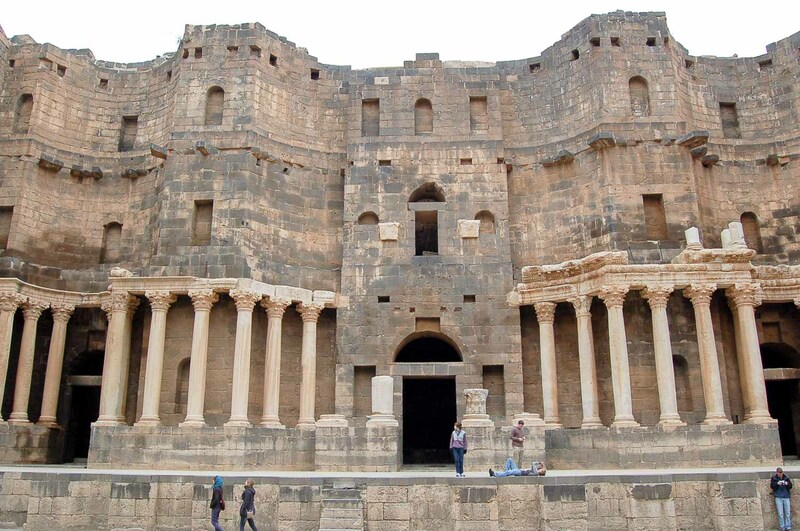 To be in Syria was to experience living heritage, to discover that much of what we think of as “history” is still alive. I journeyed to the monasteries tucked into the hills surrounding Damascus, and found the villages around them still populated with ancient Christian communities, some of them speaking Syriac, a dialect of Aramaic, the language of Jesus. The monastery of Deir Mar Musa, a monastery dedicated to Muslim Christian dialogue, in the snow. Photo by Stephanie Saldaña. But they were also evidence of shared heritage, for the monasteries were often full of Muslim visitors, who journeyed in great number in order to honor the Virgin Mary, who is revered by Muslims as well as Christians. Many would pray for the health of their children, or to be blessed with a new child. The country itself was an enormous, open-air museum, and you could not go far without stumbling onto an ancient city. In the North of the country, you could look out the windows of a moving car to see the ruins of hundreds of abandoned Byzantine cities, laid bare on the side of the road. And even the ruins themselves were reminders of the country’s capacity to absorb—to even celebrate—difference that in some other environment might have been mocked or rejected. The ruins of the Church of San Simeon, open and surrounded by trees, encircled a small stone—all that remained of the pillar where the famous stylite San Simeon had attempted to seclude himself in the 5th century, climbing to a platform on top of a high pillar to escape the masses who followed him. Crusader castles were visible on mountaintops among the trees. 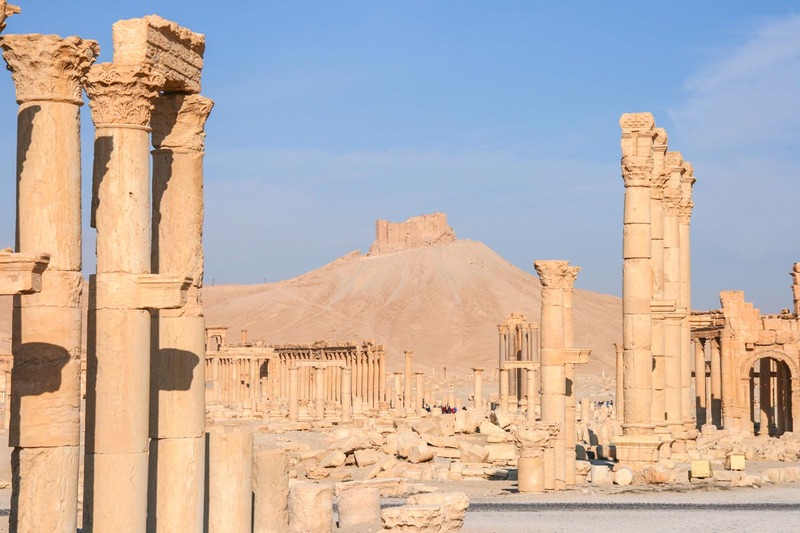 Palmyra appeared, a stunning colonnade in the middle of the desert. Entire markets were heritage sites. 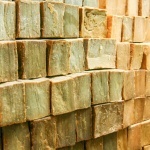 In ancient cities, bathhouses and beautifully tiled mosques, fantastic courtyard houses mingled with bicycles and bakeries and taxis and the details of our ordinary lives. 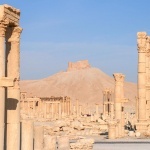 Palmyra. Photo by Linda Delikiz. It was an astonishing privilege to experience history in such a wide-open, accessible fashion, organically part of daily experience—history meant to be experienced and lived. It was as though every childhood dream played out in the corner of a bedroom- of castles and ancient cities—was made real and placed into a country. Yet even with all of these physical marvels, the deepest heritage of Syria lay in the people themselves, in their diverse histories and stories. The crossing and mixing of its people was in evidence everywhere, from the clothing to the language, the music to the food. The cuisine of Aleppo was famous for its mixture of spicy and sweet, having been influenced by the large Armenian population, the ancient Jewish population that had only recently left, the nearby Kurdish populations, and the ancient trade routes passing through it. The same could be said of the cities themselves, abundant with churches and mosques and abandoned synagogues, Roman and Byzantine ruins appropriated into more modern buildings, Ottoman hammams, and Kurdish carpets for sale in the bazaars. The shopkeepers learned to change their language or dialect depending on whoever passed through their front door. 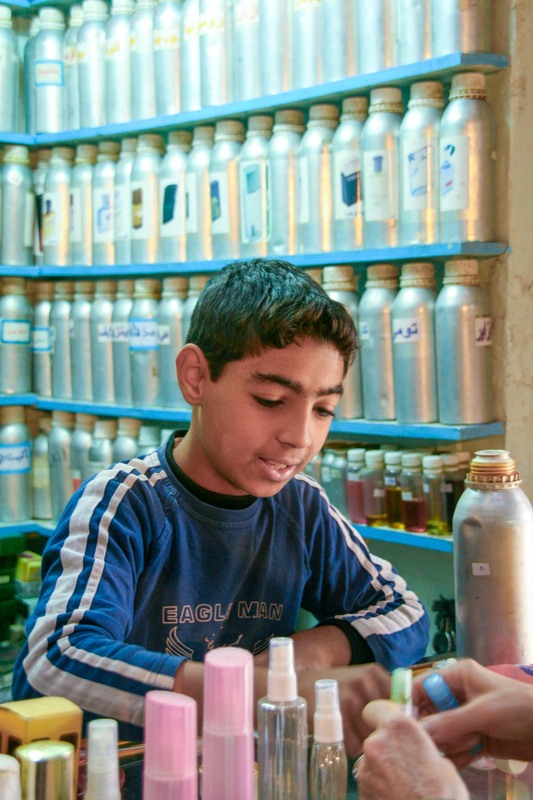 A young boy mixes perfumes. Photo by Linda Delikiz. And it was a place where afternoons slowed down, where local artisans and shopkeepers had not lost their appreciation for detail and beauty. There always seemed to be enough time. Bakers lovingly pressed pistachios into desserts and placed them carefully onto trays. 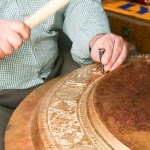 Craftsmen painstakingly created the inlaid wooden tables and trays they were known for by gluing different woods side by side, often adding mother of pearl. A few men still hammered out details into metal trays, or mixed perfume by hand in stalls in the marketplace. Even the ice cream was pounded out by hand. 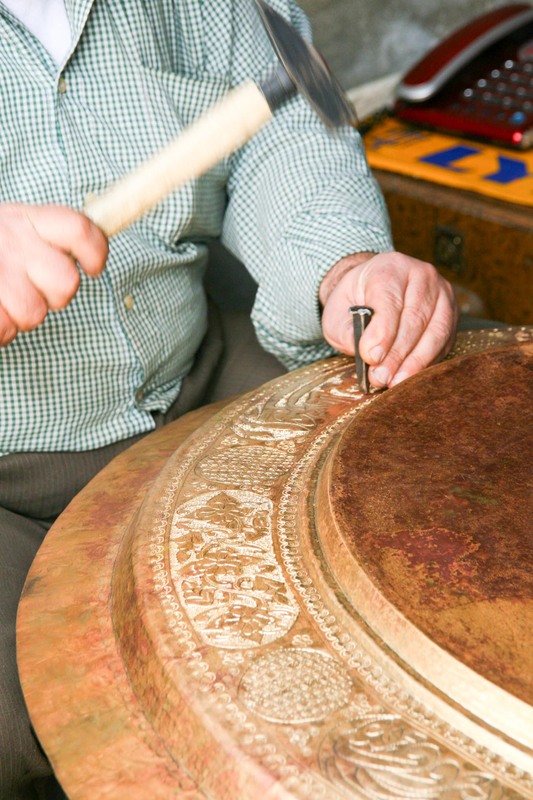 Syrian coppersmiths are some of the most famous in the world. Photo by Linda Delikiz. To be there was to discover how much love and attention could be given to the making of things— a cup of coffee—or the famous helawet il jibn— a cheese filled pastry from Hama so delicious that people would travel there just to taste it. It was where I learned that rose petals could be distilled to give flavor to water or food. That olive oil could be pressed into soap. That pomegranate could be distilled into syrup. 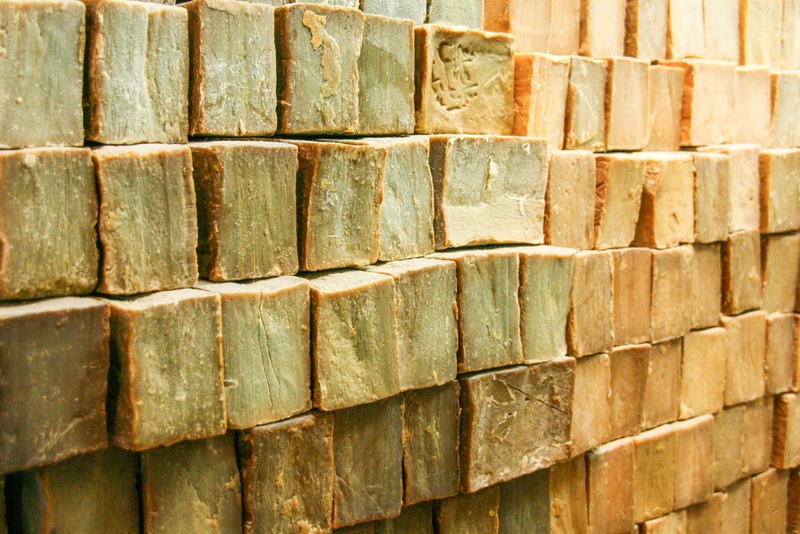 The city of Aleppo is well-known for its olive oil soap. Photo by Linda Delikiz. At one point, I had to design a new way to walk home at the end of the day, to avoid the many invitations for coffee from shopkeepers and friends who always had time to sit and reflect on the days events, and to give attention to whoever passed into their life. Perhaps that is why the single year I lived in Syria marked me so profoundly. The stillness, the attention to detail, the beauty were like poetry writ large, across an entire landscape. It was a place in which to learn the essence of life, and all of the beauty contained within it. At the end of the day, the last hakawati of Damascus—the famous storyteller would hold court at the al-Nofara coffee shop beneath the Umayyed mosque, spinning stories from ancient books to those who gathered to listen. Yes, there was even still time for listening to stories—spun out over days and weeks. Eventually, the call to prayer would descend from the mosque: which in Damascus was famously not one voice but three, woven together in harmony— difference becoming one. As I write this, it is unavoidable to think about all that has been lost, and is being lost still. Above all, it is impossible not to think of the people, of all that they have weathered—to wonder where they have gone, what they carried with them and left behind. The best of the country was always not within the stones but within the people themselves—in the immense hospitality they were famous for, their diverse stories, their kindness to strangers.